Recently, we looked at county-by-county trends in the use of Supplemental Nutrition Assistance Program (SNAP) benefits, known as CalFresh in California. While more than one in 10 Californians received CalFresh overall in 2013, there is significant variation among counties. For example, in parts of the relatively wealthy Bay Area, just about 4 percent of residents were enrolled in the program. But in San Bernardino County and many Central Valley communities, more than one in six people receive help buying groceries. The California Department of Social Services has created a CalFresh Data Dashboard to help researchers and advocates measure counties’ performance in enrolling recipients, including by providing certain demographic characteristics such as age and language spoken at home. 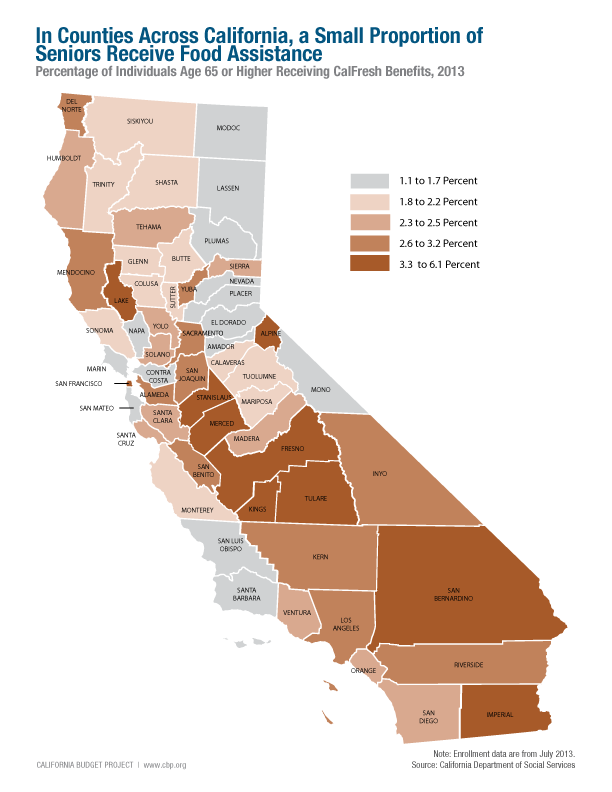 The map below shows percentages of all children under age 18 in each county who were receiving CalFresh benefits in 2013. These statistics should call attention to the persistent problem of child poverty even at a time when the state is experiencing job growth. Because eligibility is generally capped at 130 percent of the poverty line (about $25,000 for a family of three), high rates of CalFresh use are another indicator of the extent to which many families are still struggling to meet their most basic needs in the aftermath of the Great Recession. Statewide, one in four children are enrolled in CalFresh. This rate is comparable to the highest county rate for people of all ages, demonstrating that children are especially vulnerable to poverty and food insecurity. In nine counties, at least one in three children are eating with the help of CalFresh benefits. Del Norte, Fresno, Imperial, Kern, Lake, Merced, Madera, San Bernardino, and Tulare counties are home to children receiving CalFresh at rates above 33 percent. This closely matches the counties with the highest overall poverty rates since 2008. Nearly half of all children in Tulare County receive CalFresh. Coupled with a county child poverty rate above 36 percent, this exemplifies the extent to which sections of the state have yet to see the economic recovery. In a recent blog post, we wrote about the importance of CalFresh for children. Research shows that food assistance not only reduces hunger, but significantly improves young children’s health, reducing their odds of being underweight or at risk of developmental delays. These benefits are lasting. A recent academic paper found that low-income children who had access to food assistance early on were significantly less likely to suffer from chronic health conditions throughout their life. The girls in these families generally achieved higher levels of education, had higher earnings, and were less likely to need public assistance as adults. Efforts to ensure that eligible children obtain food assistance are thus especially important. While it is difficult to estimate the potential number of eligible children not being reached, California’s overall CalFresh participation rate is just 57 percent — the lowest rate in the nation — meaning that nearly half of those who qualify for assistance are not receiving it. While the state pays a portion of administrative costs, counties are chiefly responsible for outreach and enrollment. Comparing county performance over time may yield key lessons on what works to improve access for different segments of the population. At a joint hearing of the Senate and Assembly Human Services Committees today, March 11, at 1:30 p.m. in Capitol Room 437, invited testimony from the California Budget Project will highlight just how prevalent food insecurity is in California and the toll that food insecurity can take on children and families. Food insecurity occurs when families lack the available means to obtain enough nutritious food to thrive, which means they face hunger or the threat of hunger. This is due to a lack of money and other resources. In California, more than one in seven households were food insecure in 2012, the most recent year for which data are available. Only 11 states have a larger share of households experiencing food insecurity than does California. The percentage of food-insecure households in our state has increased by 44 percent since 2006, and has remained fairly constant since 2008. This shows that the recovery from the Great Recession has not reached many low-income Californians. Food insecurity and poverty often go hand-in-hand, but public policies can help address these problems. According to the Public Policy Institute of California’s California Poverty Measure, CalFresh and CalWORKs lifted hundreds of thousands of children out of poverty in 2011. Taking measures to boost CalFresh participation and to increase the CalWORKs grant would go far in reducing food insecurity in California. These are among the issues that the joint hearing will take up today.